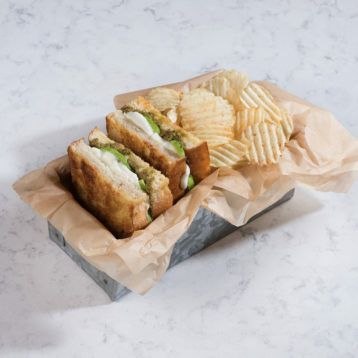 Take your sandwiches and toasties to the next level by adding Filippo Berio Pesto. Pair with soup for an easy midweek lunch or dinner! Brush one side of each slice of bread with pesto. Layer avocado and mozzarella over half of the slices; sprinkle with salt and pepper. Top with remaining bread. Brush outside of sandwiches with oil. Heat large skillet (or toastie maker) over medium-low heat; cook sandwiches, in batches if needed, for 2 to 3 minutes per side, pressing lightly, until bread is golden brown and cheese is melted. This sandwich is just as delicious made with Filippo Berio Sundried Tomato Pesto. Add a pinch of hot pepper flakes to the sandwich for a spicy addition.